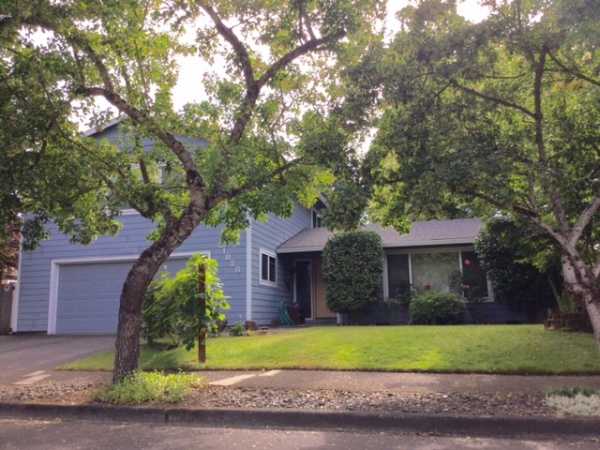 Four bedroom Tualatin home steps from Byrom Elementary! This 4 bedroom 3 bath home is a must see. The downstairs boasts an open concept with the kitchen open to the dining area and the living room. Hardwood floors, custom paint and stained glass windows make this home really special. The kitchen has two ovens and ample storage with a garden window looking out to the back yard. The dining opens to the back yard through glass sliders. A corner gas fireplace and large windows makes the living room a great place to entertain. There are three bedrooms and two bathrooms downstairs including the master suite. Upstairs there is a large bonus room complete with wet bar and small fridge. A fourth bedroom and bathroom is upstairs as well. This property has a beautiful and private back yard with organic berry plants, a patio and deck. Just across the street is a walking path that connects you to the award winning Byrom elementary school.